Life in the mountains of Costa Rica revolves around nature. Nature and the pleasure of being surrounded by constant spring weather, spectacular scenery, and lush growing tropical plants. Or, for those who work the land, it’s nature and business, whether that relates to eco-tourism or production of crops. 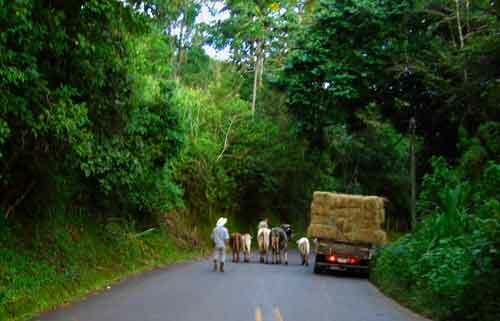 Naturally there is a strong agricultural base to the economy of the mountains in Costa Rica. A typical range of produce includes coffee, sugarcane, tobacco, diary, cattle, tilapia (a fresh water fish) and fruit trees. These are grown on areas of land referred to as ‘fincas’, or farms, or indeed just a fenced off area of land, and with a huge range in sizes to which the same term applies. The Ticos love their ‘fincita’ lifestyle, so much so that many middle class families will own a sort of ‘weekender’ to allow them to get away from their city jobs and back into nature. This may be a simple small lot with cabina, or a 20 hectare (50 acre) finca with rancho and cattle in full production. In both cases getting back down on the farm is valued highly and looked forward to with great pleasure. In practice if you live here, this means you continuously encounter trucks moving produce and cattle, and occasionally cattle moving on the road, but especially in our area, it means horses. 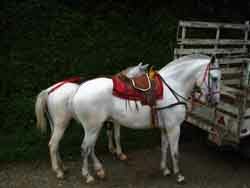 The Ticos here love their horses. There are yearly horse fairs called ‘Topes’ which do the rounds of all the provincial towns in the country. Puriscal hosts one of the largest. The horses are trained to move in a prancing gait, kicking back their legs with each step. Riders will train for hours to get it just right for the next Tope. These mountain horses tend to be of a smaller variety than what I’m used to seeing. They are better adapted to the steep mountain terrain, more sure footed over treacherous gravel backroads in wet conditions. 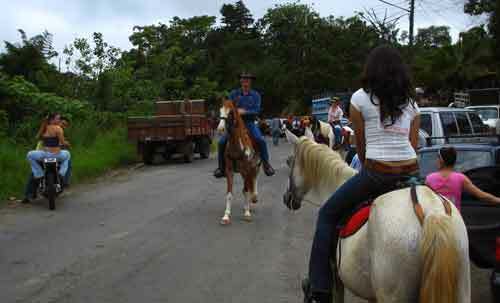 In our area cabalgatas - a social gathering of horses and riders for the purpose of a communal ride through the countryside – are a regular event. This is an incredible way to get to know the countryside, as the routes chosen take you through trails and places known only to the locals.